Brighton & Hove is regarded by many as one of the thriving cities of the UK, booming socially, culturally and economically. However, for many, the reality of life in the city is a struggle. Housing and living costs are high, but many jobs may not pay enough to meet these costs. People may not be able to find a job if they don’t have the right skills or are in poor health. As the city grows, more people will want to move here. At the same time, there is less money for public services and for people who need help. We need to respond to these issues collectively to make sure vulnerable people are not left behind. Why was the commission formed? The Fairness Commission was formed to make sure that everyone has a share in the city's economic success and an opportunity to lead healthy and productive lives. It was set up by the council, but was an independent body. The commission explored issues that cause inequality and listen to the concerns of residents, community organisations and businesses across the city. Over the last five years, Fairness Commissions and similar groups have been set up in 24 areas in the UK including Plymouth and Greater Manchester. Each group set out to tackle inequality and poverty at a local level during central government funding reductions. What did the commission do? The commission held a series of public meetings to look at the most significant issues facing the city. These issues and themes were chosen by the commission after considering research about inequality in the city and the budgets and priorities for vital city services. Council partners, service providers and community leaders were asked to come and speak to the commission. 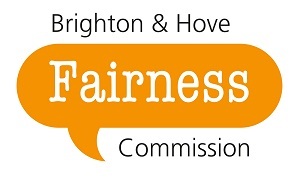 Commissioners also visited schools, held community-based workshops and encouraged people to share their personal views about fairness in Brighton & Hove. This evidence gathering took around 6 months and allowed the commission to hear the views of as many people as possible. How did the commission make a difference? The commission used the evidence gathered to recommend practical ways of making Brighton & Hove a fairer and more equal place to live. The Fairness Commission shared their report in June 2016. The findings will inform the council’s budgets and make sure resources are being used to tackle inequality. It will make recommendations to the council and its partners to increase opportunities for the city's residents. Watch the video on YouTube or view the video transcript (PDF 360KB).